I haven’t said much political in a while. Moreover, amid all the talk of budget balancing and sequesters, I’d like to shift attention to a topic that may - at first sight - seem a bit wonkish and detached: farm subsidies. In fact, they are an area where Blue America remains frightfully ignorant and where the flood of entitlement spending merits closer attention, in times of near bankruptcy. Are we entering a new era of negotiation? Amid the flux of rapid change, new alliances and alignments are being made, as we speak. Some conservative pastors are reversing what had been standard dogma, speaking out for "creation-tending" and action on climate change. Meanwhile, the Sierra Club and other environmental groups are cautiously easing (even in the wake of Fukushima) their once-rigid opposition toward nuclear power. While Barack Obama and the democrats show flexibility toward cautious offshore drilling, a few Republican legislators showed a willingness to pursue more stringent gas mileage standards and cap-and-trade methods for curbing greenhouse gases. Of course, in some of these cases, what we're seeing is another example of "leaders" following the public, rather than the other way around. Still, after the century's first decade (the Nasty Oughts) featured intransigent Culture War, is it possible we are witnessing a gradual return to the other, classic American pattern? That of even-tempered pragmatism? Finally shaking off a bad case of Future Shock that swept America, along with that fearsome "2" in the millennium column. I guess we'll find out, if (as predicted by my friend, the renowned business pundit John Mauldin) Democrats and republicans astonish everyone with a sensible compromise budget deal. If so, it has to be only the beginning. After immigration reform and modest sensibility on assault weapons, there are some other sticky matters badly in need of a fresh look. Let's zero in on one area where logic and pragmatism have been in short supply -- the question of farm subsidies, and how they lately spurred a giant biofuels industry -- one that could have been set up sensibly, but for the simplemindedness of all sides, leaving in place little more than a wasteful scam. First a little history, of the biblical kind. Remember Joseph? He of the technicolor coat, who wandered into Egypt and interpreted a Pharaoh's dream? Seven fat cows, followed by seven skinny ones. These, Joseph announced, forecast a time of bumper harvests, followed by one of devastating famine. That is, unless sufficient stocks were bought and stored away. Which the forewarned Pharaoh did, whereupon he ultimately thanked Joseph for saving the nation. Historians now verify that the Egyptian state used to do this sort of thing often, in a routine and simple way. Whenever crops grew abundant and grain prices were low, the government bought and stored grain, both assisting farmers hit by low prices and creating a stockpiled reserve. When supplies ran thin and prices ran high, the caches were opened and stores sold, softening price swings, letting both farmers and consumers have a little predictability in life. Any resulting profit to the government helped to maintain to the granaries. A simple system. Everyone benefited. Farmers weren't bankrupted by too-good harvest years. The people weren't starved and taken advantage of in lean times. Taxpayers got their money's worth. The state's useful role paid for itself. Now, there were a few special circumstances that helped Pharoanic Egypt master this trick. The dry climate allowed grain storage for extended periods. Also, there are a few things that simple-minded kingdoms do really well, such as repeating the same working pattern, over and over. Pivotally, those ancient farmers did not have a powerful voting bloc, able to sway government policy and alter the arrangement in shortsighted ways -- a failure mode of later, more sophisticated nations. Notably, urban taxpayers never demanded payback for a cent of all that rural infrastructural support -- a tradition that continues today, as rivers of tax dollars continue to flow from Blue to Red. Nor should they. (Nor should rural folk brag about how "independent" they are.) We need each other. E pluribus unum. How did Farm Policy Leave Common Sense Behind? Infrastructure is an easy decision, but how to damp those pesky swings in market price? Of course, a direct approach for achieving rural assistance, and one that involves the most market-meddling, has been direct farm subsidy payments and price supports. And, way back in the 1930s, the first recourse looked pretty darn traditional. The government simply bought up extra food and gave it to poor people. Some of the grain and milk got turned into storable items, like flour and cheese, to serve as a national reserve before getting recycled through food stamps and school lunch programs. And, yes, the government bought grains when they were cheap and sold them later, when the price was high. All very logical. Almost Egyptian. Only progress follows progress. With all that education and infrastructure and investment, farmers got a whole lot better at their business. There came a time when US agriculturalists could not be stopped from producing too much! Domestically, at least, there was no longer a "famine" side of the cycle, for the government to dump its stockpiles into. And sure, the government tried making this a win-win by sending massive amounts of food overseas, as foreign aid. But, while some of this was genuinely life-saving, we now know that another result was -- just as often -- to undermine local agricultural systems and wreck a developing nation's ability to feed itself. Beware of unforeseen consequences. But then, we are a nation where political power was deliberately tilted, from the beginning, toward rural states. And, as one might expect, there came pressure for change. It began to occur to clever people that governments can be arm-twisted into giving, without getting anything in return. (After all, look at the dams and highways and schools.) So, polemical tricks were used. For government to buy land and surplus produce was "socialistic." On the other hand, simply paying farmers to keep their land, but not to grow anything on it, well, that somehow made sense and was not socialistic at all! Only let's get back to Joseph; note how the second half of the ancient cycle is now almost completely missing. When the government used to stabilize low prices by buying something material (grain or land) it acquired a palpable reserve that it could then use in emergencies, or sell when prices were high. But, today, there are no large federal stocks of food pouring forth to ease the skyrocketing supermarket prices, nor stocks of reserved land being nurtured in fallow-recovery, or else offered to young, suburban couples to try their hand, as new farming pioneers. Nor are the direct-payment subsidies being cut back, now that floods of profit are pouring into agribusiness. It is no longer a matter of cycle balancing. It is an entitlement. Indeed, one sees some very "non-egyptian" things going on... like a US government hurrying to fill the National Strategic Petroleum Reserve with high priced oil. The same government that (does anybody at all recall?) sold out of the reserve, years ago, when prices were low. Buy high and sell low. Very "non-egyptian," indeed. What Does Any Of This Have To Do With Biofeuls And Ethanol? "North America has experienced great weather for the last 18 consecutive years, which, combined with other improvements in agriculture, has resulted in abundant crops. According to Donald Coxe, chief strategist of Harris Investment Management , you have to go back 800 years to find a period of such favorable weather for so long a time. Yet food stocks in corn, wheat, rice, etc. are dangerously low. We are just one bad weather season from a potential worldwide food disaster. And Dennis Gartman has been pointing out almost daily how far behind US farmers are in getting their corn crops planted, due to bad weather:" Further. “… the corn crop really is behind schedule. Corn is not like wheat. Wheat can survive drought; it can survive cold; wheat, as we were taught by our mentor, Mr. Melvin Ford, many years ago, is a weed. It is an amazing, resilient plant. But corn is temperamental; it needs rain when it needs rain; it needs dry conditions when it needs dry conditions. It needs to not be hit by early season frost, or it will suffer, and it needs a rather archly set number of days to grow. Each day lost at the front end of the planting/growing season puts pressure upon the corn plant to finish its job before the autumn frosts, and puts increased soybean acreage and decreased corn acreage before us. Meanwhile, ranchers are reducing their herds, as they cannot afford to feed them due to high grain prices.The same thing is happening with chickens. This means sometime this fall supplies of meat of all types are going to be reduced. 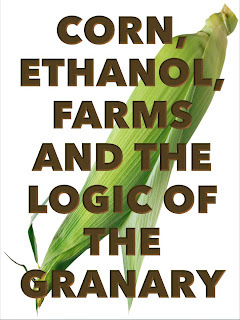 Maybe someone will point out that using corn to produce ethanol has the unwanted and unintended consequence of driving up food prices all over the world." So, then, let's bring in ethanol. In recent years, a heavy and generous federal subsidy has created a vast corn-to-ethanol industry whose effects are causing a lot of public debate. Environmentalists claim that it takes more than a gallon of imported oil to actually create a gallon of ethanol fuel. The greenhouse gas benefits are negligible and possibly negative. According to Mauldin, the price and energy balance would be much better if we imported Brazillian sugar cane, which seems made for ethanol production. But farmers in Idaho apparently have a veto over anything sensible like that. Today, the special interests are vast and well-entrenched, so don't expect them to enter into negotiations to find a logical way out of this mess. Indignant rationalizations abound, and every person seems convinced that their own version of government-suckling is not socialism. It is patriotism. Now, things are changing, and not just because scientific studies show ethanol fuels to be at-best a breakeven proposition, doing nothing for energy independence or reduction of environmental damage. Beyond that - according to a New York Times report, "Nearly 10 percent of the nation’s ethanol plants have stopped production over the past year, in part because the drought that has ravaged much of the nation’s crops pushed commodity prices so high that ethanol has become too expensive to produce. A dip in gasoline consumption has compounded the industry’s problem by reducing the demand for ethanol." Advanced biofuels from waste like corn stalks and wood chips have also yet to reach commercial-level production as some had predicted they would by now. But now I plan to surprise you. I will speak up not only for government price intervention to help farmers, but also for subsidized biofuel alcohol! Though not as it is being done today. Perhaps it is time to take a look back at the Egyptians of old, and go back to the root of the problem, so to speak. Farmers (especially giant agribusinesses) do not deserve automatic subsidies as some kind of birthright. On the other hand, the ancients were onto something. We are all better off if farmers are cushioned from wild market swings and get the kind of predictability that can let them invest in what is, after all, a business vital to us all. Back when the New Dealers and Great Society folks tried to balance the cycles by buying cheap-excess bumper crops and storing for lean days, they ran into a problem. A vast, continental nation can only store up so much grain and cheese. In part, the move to simple cash grants came out of despair over how to do the job effectively, the Egyptian way. But here is where alcohol comes in! Because alcohol can be stored. In fact, it can be stocked away indefinitely, cheaply and beautifully.What was done poorly under Lyndon Johnson... turning excess farm production into mountains of wasted cheese... can now be accomplished logically and efficiently.... if we make biofuel ethanol a seasonal or occasional way to absorb and store, and later use, surges in excess grain production. What should we do? Let the ethanol subsidy go away. It is an insane market interference, choosing a market winner and a dumb one, at that.The money could be far better used making up for years of deliberately-sabotaged research into energy independence. Stop the gasohol mandate now! But don't shut down the gasohol plants completely. Instead, let the taxpayers buy excess corn whenever its price is worrisomely low, convert the surplus into storable form, and sell the alcohol later, when the price seems right. That is the exact equivalent of the Pharaoh's storehouse. And let the government's profit go to maintaining this reserve capacity, when it is un-needed. We need to stop thinking of ethanol as an alternative to imported oil. That's just silly and a crutch for those diverting us from real solutions for energy independence. Nevertheless, ethanol can be viewed as a wonderful way to store the excess produce of America's fertile fields, in a form that will be easily convertible, at some future date, into fuel or money... and thus even back into food. And yes, chuckle at the image that is brought to mind. Nearly all of the American founders - especially George Washington - distilled their own moonshine. It often served as cash and currency for farmers, when money was scarce. Alcohol flows through our national blood, in a sense. And if we view it properly, it can answer the modernized Riddle of Joseph, offering a way to damp the waste of fat years and help us prepare for the lean one that will surely come.